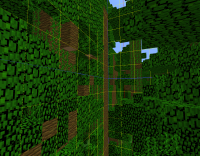 Jungle Trees split by chunk borders form only half the tree. 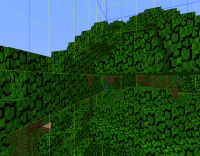 Sometimes, when a jungle tree is generated on a chunk border (the chunk border goes through the centre of the trunk), only half the tree generates. Sometimes only some of the leaves are cut off along chunk borders. 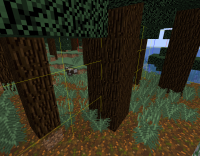 This only appears to happen when the border cuts through the tree trunk, and only on world generation, not when a tree is grown from a sapling on a chunk border. 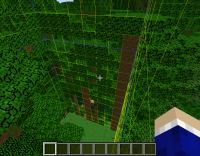 This does not appear to affect any other kind of 2x2 or 1x1 tree except the jungle tree (based on my searching through Mega Taiga, Jungle, and Roofed Forest biomes), and only affects 18w15a. May be related to MC-125283 (jungle biomes are extremely cluttered), and/or MC-124895 (Trees generate side by side).